________________________________Urnex Brands, Inc: Specialty Cleaning Products for Coffee and Espresso Equipment Since 1936. Cafiza Espresso Machine Cleaning Tablets are now packaged on convenient blister cards. 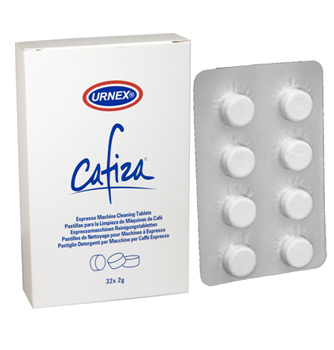 Cafiza Tablets are specifically designed for use on a wide-range of super automatic espresso machines, and can also be used on traditional espresso machines to perform a back flush cleaning. Urnex Urn and Brewer Cleaner is designed to remove stale coffee oil residue and ensure consistently great tasting beverages. 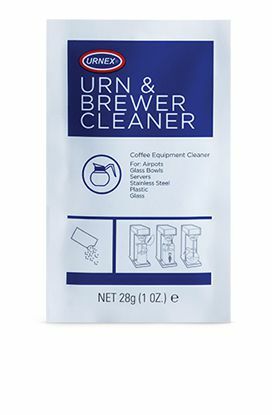 Urnex Urn and Brewer Cleaner is recommended for use on a wide range of equipment including coffee urns, airpots, thermal servers, and glass bowls. 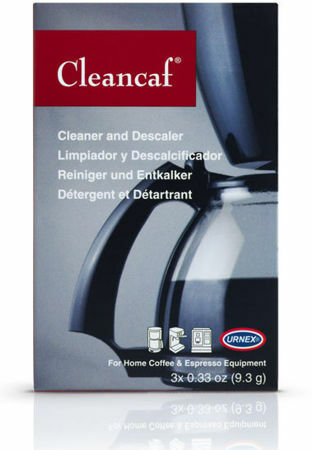 As with many other Urnex products, Urnex Urn and Brewer Cleaner is NSF certified for safety and metal compatibility. 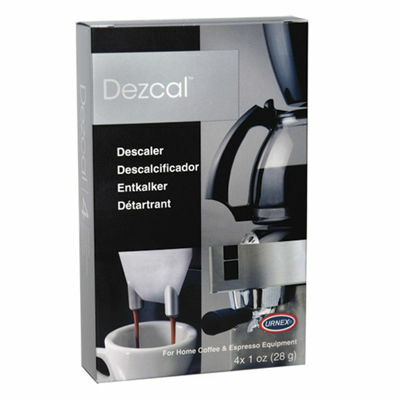 Dezcal Activated Scale Remover is specifically formulated to effectively descale hot water tanks and components of coffee and espresso machinery. By removing mineral deposits which clog and impair brewing equipment, Dezcal allows machines to perform at optimal levels. Non-toxic and bio-degradable, Dezcal is suitable for use by both professional technicians and home users alike. When used on commercial and "closed system" brewers (with a holding tank), special attention should be paid to rinsing. Cleancaf® eliminates residual coffee oils and build-up in your machine that can become rancid and lead to bitter tasting coffee. Using Cleancaf® is as easy as brewing a pot of coffee. Each box contains three packets of cleaning powder. All Images Copyright © | Astra M Group Ltd. | All Rights Reserved.